Under The Copper Tree: Tomatoes Everywhere!!! I stopped by the garden tonight to round up some veggies. Pretty sure I got five pounds of tomatoes, and there are plenty where they came from. I'm pretty sure these were the Early Girl (or Boy... still early) and Celebrity. Glad I went with those and not the Romas or San Marzano. WOOHOO!!! My green thumb is alive and kicking. 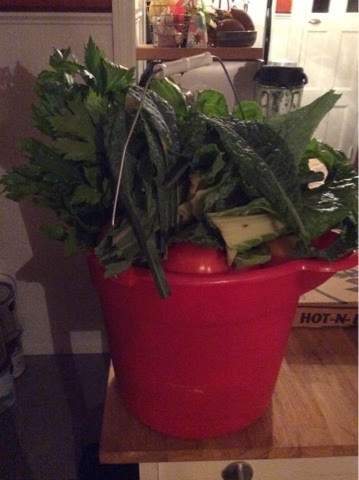 I also got a bunch of celery and handfuls of kale and chard. I need to do better on using all these vegetables. Or at least harvest more often and give them away. So my fellow gardeners, what have you been picking from your veggie patch?